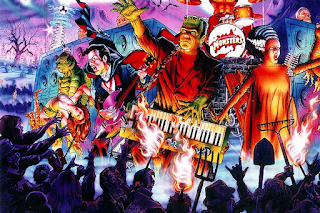 UFO SPRINGS -- Dracula served the drinks, Frankenstein’s Monster and The Bride provided the electric atmosphere, the Invisible Man told the jokes, and Klaris the Mummy crooned with his Klarisketeers. The place is the Stage Roar Canteen over the hill from Old MacDonald’s Farm near one of the first ever saucer landing sites at Area 13 in UFO Springs, and at one time, Transyl-vein-ia’s biggest stars served zombies and mutants of Transyl-vein-ia’s Armed, Legged, Winged and Finned Forces headed off to war against alien invaders. G.I.s enjoyed war, but sometimes they needed a break from battle. And so the Stage Roar Canteen offered a welcome opportunity to discover all new anxieties. In war, zombie G.I.s feasted on brains contaminated with dirt, UFO fuels, shrapnel and other foreign objects, therefore, Chef Sludgeflinger and his cooking staff concocted new brain recipes to include rare poisons, mold and spores on top of the other pollutants. Today, many years after the alien invasions, the Stage Roar Canteen serves these same dishes as a way to remember the bad ol’ days of fine war and nasty, lethal meals. The folks at the Canteen also present the best in big band performances of the day, with low-class acts from Goon Miller and his band, Benny Badman, Artie Ahhh! and Alien “Puke” Ellington. On occasion, you’ll see monsters still dancing the Lindy Flop, the Critterbug and the Balboa Constrictor. To make reservations at the Canteen, simply go to the nearest Armed, Legged, Winged and Finned Forces recruiter and enlist. This is the scariest story ever!